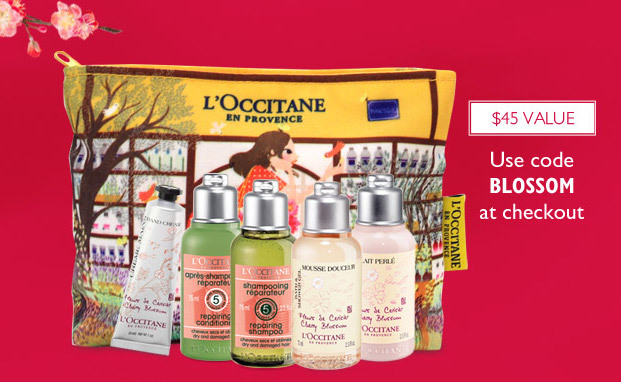 With this new offer from L’Occitane you can enjoy The Blossoming Beauty Collection for only $20 ($45 value!) with any $45+ purchase! This travel ready beauty collection includes cherry blossom bath and shower gel (2.5 oz), hand cream (1 oz.) and body lotion (2/5 oz. ), repairing shampoo (2.5 oz.) and conditioner (2.5 oz.) in an adorable pouch. Just enter coupon code BLOSSOM at checkout to redeem this offer. Valid through February 18, 2014. Limited quantities available. This entry was posted in Uncategorized on February 7, 2014 by Chrysa.